We have made our Christmas tradition to celebrate with our immediate little family on Christmas eve and Christmas morning to open stockings and presents from each other. Then my family joins us for the day. This year was great because Delaney was really into putting out cookies and milk, and carrots and water for Santa and the reindeer. 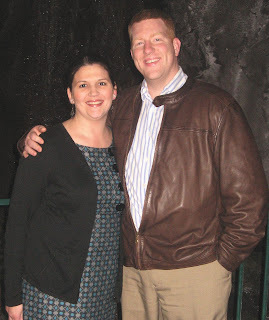 Her enthusiasm was very much contagious and made the holidays very rewarding for Jon and I. 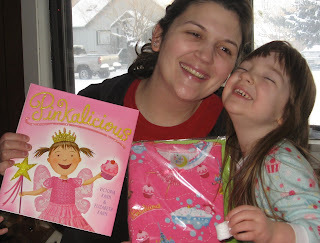 She was just so excited for everything she opened even in her stocking, it was adorable! Adelyn was really cute too. She was not quite as excited, but she would rip the paper if we started it. Christmas has always been a nice family holiday for me but it is so much more than that with kids! They make the season magic, and we are so lucky to have them. This is the finished product! 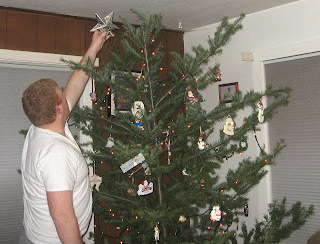 We sure had fun listening to Christmas tunes and drinking cocoa while decorating the tree. The girls helped by adding comic relief at best. It's my favorite time because I get to reminicse over each ornament we have and where it came from. Jon and Brittany in Vegas, baby! The girls at Grandpa's Christmas Party! My Dad's company has a Christmas party every year just for the children and grandchildren of the employees. They have bouncy houses, cookie making, games, pics with Santa and more. The girls love it and my Dad does too. 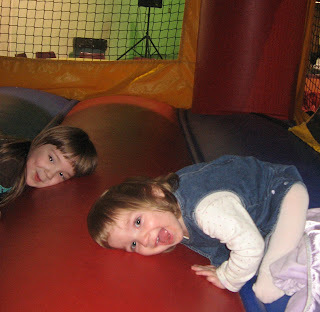 Addy got to go in the bouncy house with big sis this year and it was so much fun to watch! It's a fun time we look forward to every year. Our mountain jaunt for the perfect tree! 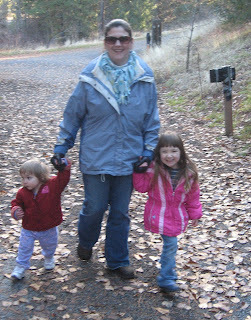 I am making an attempt here to catch up so here is our trip to get our Christmas tree. You can see there was no snow, which actually made it a lot easier to find one. I think Delaney would have liked to play in the snow a bit though. Although she kept saying that we were lost in the woods so you can imagine how it would have been if everything was white. We had a great family time, and found a nice tree too! 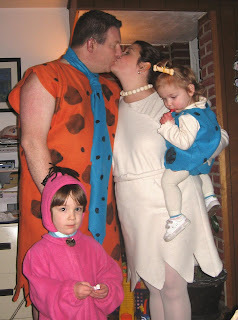 Halloween this year featured the Guddat family as the lovable Flintstones of Bedrock. We had Fred, Wilma, Pebbles, and of course our pet Dino! This was the first year that Addy got to trick or treat and that Delaney really got into so it was a really great night. We love to dress up as a family, and my Mom (Brittany's) made all the costumes. By the end of the night we were already asking my Mom what we were going to be next year! She does a great job, and Jon even wore his to a work costume party and won. All the people there wanted to put her to work. The weather wasn't too bad and the girls made a pretty decent haul and I am sure that Delaney is determined to rot her teeth out by Thanksgiving. 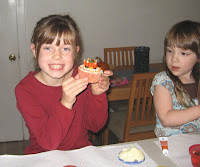 Delaney and I made strawberry cupcakes for her birthday and she had a blast! She is a regular little Betty Crocker. The mix smelled so good she kept just standing there and sniffing it, it was so cute! Delaney loves to crack eggs and add them to bowls and I think we only got a tiny shell in the cupckes. She tried to pour the mix into the pans but just kept getting frustrated because she kept spilling. So I just reminded her how she got to frost them the next day with her friend Megan and she was happy again. She loves to bake with me and is always a big help. Her fave part is when they come out of the oven all hot and risen, she says, "yay!"